So one problem I always have when I make soups is that I don’t have one really big pot. So if you’re like me, you can use two. 1. To get started, heat the olive oil in your biggest pot. Once the olive oil is hot, add the onion and saute for a few minutes until it is translucent. Then add the garlic and cook for another minute or two. At this point, if you need to use a second pot, go ahead and heat it up and put some of the onion/garlic mixture in it. Then add the spinach, tomatoes, vegetable/chicken stock, and water. If you are using two pots, add some of each ingredient to each pot. Bring the pot to a boil. Once it is boiling, reduce the heat to medium. 2. Now, add the orzo. Again, if you’re using two pots, add some orzo to each pot. 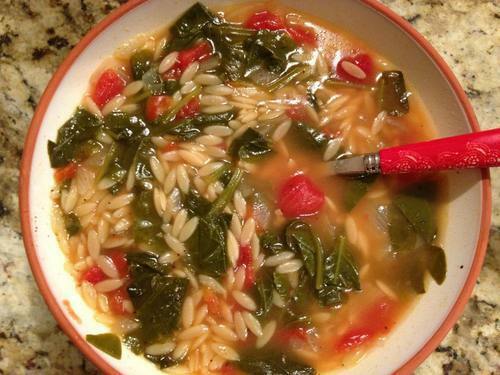 Cook for an additional 10-15 minutes until the orzo is fully cooked. 3. Now serve. I sprinkled some salt, pepper, and parmesan on top before serving it.